PLEASE FIND PRICING ON THE WESBITE SHOP UNDER MICRORINGS THANKYOU. I offer you this beautiful favorite technique offering Human hair Extensions using the micro-ring strand by strand method. Many women, including celebrities such as Rhianna, Jessica Simpson, Beyonce and Britney Spears opt for using micro ring hair extensions. This is considered by many professionals to be the preferred method for fine or fragile hair. We use Indian Or brazilian hair to work for all hair types and does no damage at all so long as you have a top up maintenance once every six to eight week which costs just £70.00. 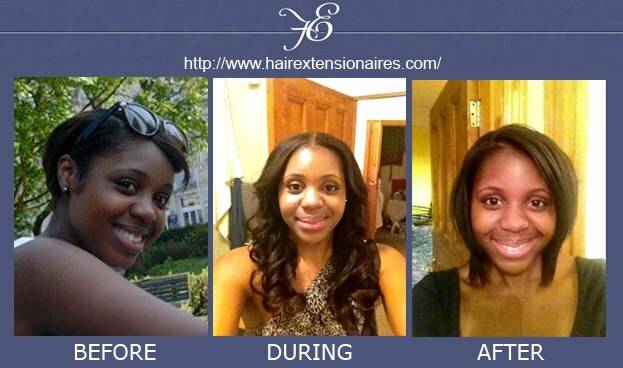 So overall your hair can stay in for anything up to 6 months then hair must be replaced after this period. I GAVE MY MODELS A FULL MAKEOVER IN THIS VIDEO!! CLICK HERE. Initial consultation-£50.00( which goes towards your end package) I am also here to discuss any hair issues at all it's 30 MINS SKYPE consultation also available if need be for £50. Thankyou. You can now have the long silky hair of your dreams without the stress of hard to remove adhesives, glues or links look more natural and stay in place until removed. Removal is a quick it takes just 20minutes and is a totally painless procedure that will not damage your hair with any chemicals or stress to your hair.